The World Cup begins on Thursday, and all through the run-up we’ve been given the predictable coverage that soccer has finally arrived as a major sport in this country. No doubt it has made great strides in the past few decades, but before succumbing to all the hype it is worth noting that soccer’s foothold in the United States remains relatively weak. 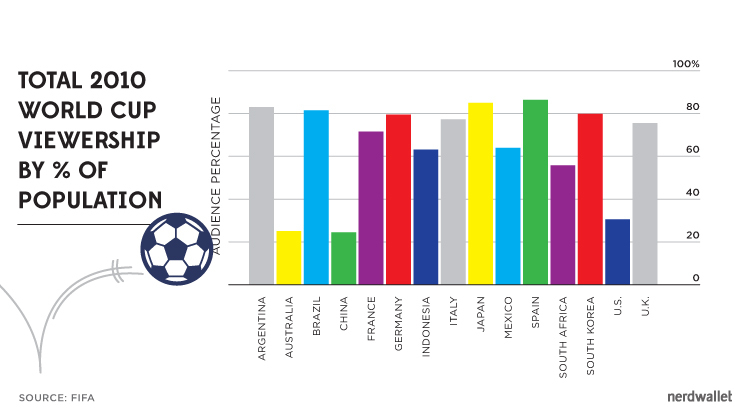 In many countries, more than half of the population tuned into the last World Cup, in 2010. Viewership in the U.S., while garnering record ratings, had among the lowest penetration rates. The average in-home viewership around the globe for each of the 64 matches in 2010 World Cup was 188.4 million. Compare that to the U.S.-record-setting 111.5 million viewers who tuned in to the 2014 Super Bowl. If you tried to watch end-to-end all 71,867 hours of television broadcasted by global networks from the 2010 World Cup, you’d be watching TV for 8.2 years straight—without sleep. The games were broadcast to 214 countries and territories, 21 more than the membership of the United Nations. 3.2 billion people watched part of the games from home in 2010, roughly half the world’s population at the time. About 909.6 million home viewers watched some of the 2010 World Cup final between the Netherlands and Spain—more than 14 times the total population of both nations, and about three times of the population of the United States. Out-of-home watchers of the 2010 final “likely pushed the total audience reach to more than 1 billion,” making it the most-watched event in the history of broadcast. FIFA expects those viewership records to fall during the games this summer, the head of broadcast told Reuters. Illustration and infographic by Brian Yee.